The two teams have a long and bloody history of fan violence which has resulted in multiple deaths over the years. RIO DE JANEIRO, BRAZIL – A violent clash between supporters of Corinthians and São Paulo has left at least fourteen injured, three shot, and five arrested. The confrontation took place in Ferraz de Vasconcelos, in the metropolitan region of São Paulo, on the morning of the two teams’ first leg final for the Campeonato Paulista this past Sunday, April 14th. 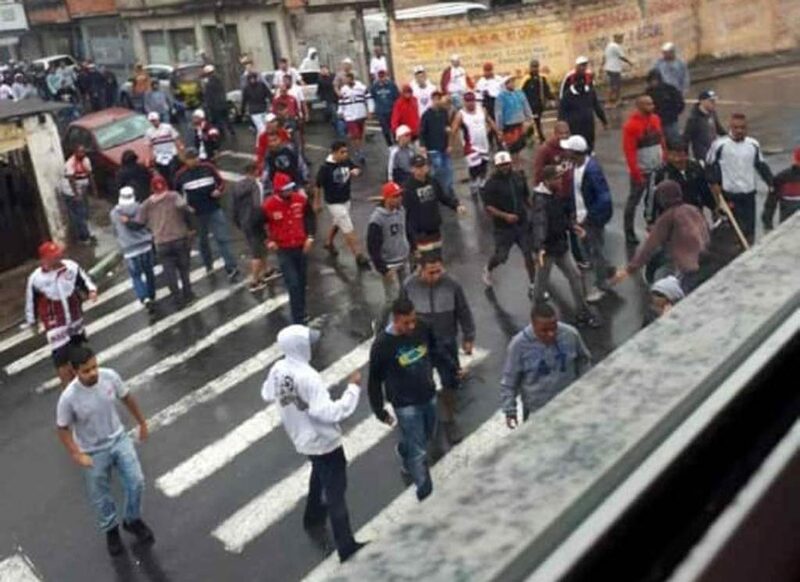 Footage has emerged on social media showing what appears to be heavily-armed São Paulo supporters heading towards a confrontation, photo internet reproduction. As reported by Universo Online, chaotic scenes descended on the São Paulo neighborhoods of Ferraz de Vasconcelos and Santa Marcelina de Itaquaquecetuba as around 200 heavily-armed São Paulo fans attacked a smaller group of Corinthians supporters. The police are quoted as saying that the attack may have been planned using social media, which could make the perpetrators easier to track and charge. Currently, five people are being held at the Civil Police station of Ferraz de Vasconcelos. In video footage that has circulated widely on social media, hundreds of São Paulo supporters can be seen charging along a street, supposedly towards their rivals, with large poles and other improvised weapons. A store-owner in the area says he had to call an ambulance after a supporter ran into his shop with a gunshot wound in his leg. Other unconfirmed reports state that the police had to use rubber bullets to disperse the troublemakers. Because of the long history of violence between the two teams, games are currently only played in front of one set of fans in a bid to avoid clashes at the stadium. The game, which took place 45 km from the violence and in front of around 59,000 São Paulo fans at the Estádio do Morumbi, ended in a no-score draw. The final will be played at Arena Corinthians next Sunday, April 21st.